The Motorcycle Riders Foundation would like to Congratulate Vince Consiglio of Michigan on his nomination and soon to be induction into the Sturgis Motorcycle Museum Freedom Fighters Hall of Fame. Each year, the Sturgis Motorcycle Museum & Hall of Fame recognizes individuals or groups who have made a long-term, positive impact on the motorcycling community. Vince joined ABATE of Michigan in 1975, and almost immediately was elected to the Board of Directors. He had spent almost four decades fighting against the mandatory helmet law in his home state before the victory finally became a reality in 2012. Vince has been a Chief Instructor since 1980 and has managed rider training ever since. He is also the current President of ABATE of Michigan and has held that position for over two decades. There is no one in the motorcyclists rights movement that has held the title of State President for 25 years, managed rider education for nearly 40 years all while battling a mandatory helmet law for nearly 40 years. Vince is also a constant presence representing the motorcyclists of Michigan in our Nations’ Capitol working closely with the Motorcycle Riders Foundation. ABATE of Michigan under Vince's leadership has fostered effective working relationships with numerous members of Congress. Many of the federal bills brought forth on behalf of the motorcyclists of this nation were sponsored and co-sponsored by members of Congress from Michigan who were designated as Legislative Champions by the Motorcycle Riders Foundation. Vince has been recognized with a Lifetime Achievement Award from the Motorcycle Riders Foundation as well as having been inducted into the Motorcycle Riders Foundation Hall of Fame in 2018. Other Sturgis Motorcycle Museum & Hall of Fame 2019 Inductees are: Frank Fritz, Jill Parham, Ron Paugh, Danny Fitzmaurice, Ron Finch, Terry Rymer, Gloria Struck and Lonnie Isam Jr 'in memoriam'. If you are planning on traveling to Sturgis for the 2019 Rally, consider joining the strong contingent of Motorcycle Rider Foundation members that will be in attendance at the Induction breakfast and ceremony on Wednesday August 7th at The Lodge at Deadwood. (3) urging State law enforcement officials to include statements condemning motorcyclist profiling in written policies and training materials. The Motorcycle Riders Foundation (MRF) applauds Congressman Walberg (R-MI), Congressman Peterson (D-MN), Congressman Burgess (R-TX) and Congressman Pocan (D-WI) for introducing this bipartisan resolution in the House of Representatives. These four Members of Congress introduced an identical bill in the last Congress which garnered 37 cosponsors but unfortunately failed to reach the House floor for a vote. While the previous effort in the House failed, the United States Senate, in December 2018 passed an identical resolution regarding motorcyclist profiling. The MRF was proud to take a leading role in passing this Senate anti-profiling resolution. The United States Senate is now on record calling for the end of motorcyclist profiling. The MRF is committed to working with the state motorcycle rights organizations (SMROs), coalitions, COC’s, the Motorcycle Profiling Project (MPP), the National Council of Clubs (NCOC), the National Coalition of Motorcyclists (NCOM), and independent riders to advance H. Res. 255. The Motorcycle Riders Foundation was saddened to hear of the passing of Michael “Fiz” Przybylo. Fiz was a Vietnam Vet serving in the Army and a long-time motorcycle rights freedom fighter. He served on the A.B.A.T.E of Michigan Board of Directors for 30 plus years and he was a long time MRF State Rep for Michigan. Fiz attended the MRF’s Meeting of The Minds conference for over two decades, his dedication, experience, and enthusiasm were an inspiration to all who attended. He owned a bike shop which allowed him to provide valuable insight and resources to the MRF during the Tier 1 and 2 and our custom bike exemption efforts during the EPA's misguided "Color and Chrome" initiative. After so many years of dedication and enthusiastic support "Fiz" was awarded the MRF's highest award, the John "Farmer" Eggers award. A.B.A.T.E of Michigan, the MRF, and the motorcyclist’s right community will miss him deeply. Memorial visitation Saturday, March 2nd, 3 pm - 8 pm with Eulogies at 6 pm at the John N. Santeiu & Son Funeral Home, Garden City, Michigan. 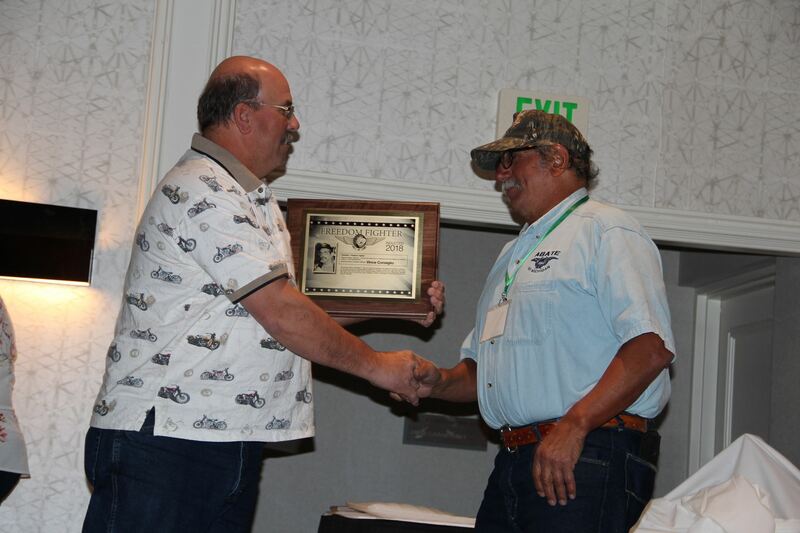 In September of 2018, the Motorcycle Riders Foundation Hall of Fame (MRFHOF) was introduced at the Meeting of the Minds in Denver, Colorado. This institution was created to recognize individuals that have worked through the MRF to positively impact motorcycling. The Motorcycle Riders Foundation is proud to announce that the nomination process for the next class of inductees into the MRFHOF is now open. The Motorcycle Riders Foundation (MRF) is proud to announce that the Motorcycle Profiling Resolution (S. Res. 154) passed the U.S. Senate with unanimous consent on Tuesday evening, December 11, 2018. Over the past few weeks, the MRF had many productive meetings on Capitol Hill to further our objective of promoting awareness of unfair profiling of motorcyclists across the country. Our resolution’s co-sponsor, Senator Ron Johnson (R-WI), has played an integral role in ensuring that the issues of motorcyclists in this country were addressed in the U.S. Senate. As you know, the MRF, along with the SMROs, the motorcycle club community, and with individual riders across this country have been advocating for a national solution to address motorcycle profiling. With the help of our champions on Capitol Hill, we have been able to advance our bipartisan and bicameral resolutions concerning the profiling of motorcyclists. On May 20, 2019 some of the membership dues for the Motorcycle Riders Foundation will increase for the first time in many years. This decision was not made lightly. As we continue to fight for your right to ride, with new and emerging threats on the horizon, this action is necessary to ensure your MRF has the tools it needs to continue to be an aggressive advocate for riders across the United States. Before this increase goes into effect, we are offering our most loyal members and supporters a chance to renew your membership at the current price. Whether you are an individual member or have a joint membership or a sustaining membership, we need your continued support. None of us can fight the enemy alone, but together we can make the difference and ensure that future generations can ride free while preserving our lifestyle. Don’t miss the May 20 deadline and don’t wait! Renew or upgrade your membership today before the increase! Ahead of a scheduled visit to Iowa on Tuesday, President Donald Trump granted the Environmental Protection Agency’s (EPA) authority to lift restrictions on higher blend of ethanol E-15 year-round. By lifting the restriction, the EPA will begin the arduous task of creating and seeking public comment on the new regulations going forward. The EPA anticipates the new rule making process will be completed by early June 2019 and would allow the sale of E-15 during summer of 2019. Currently, the sale of E-15 during the summer month’s is prohibited in some states due to the Clean Air Act. The expansion of the Renewable Fuel Standard has resulted in higher content of ethanol-blended gasoline at gas stations across America. These higher blends, like E-15 and E-85, have not been approved by the Environmental Protection Agency (EPA) for use in small engines like those in motorcycles. This is due to concerns for potential damage to fuel lines, injectors, seals, gaskets, and valve seats, as well as to carburetors. As a result, many motorcycle manufacturers now include statements in the manual that any warranty would be voided if E-15 or higher is used. What does this mean for our motorcycles? Well, we already know that EPA guidance on E-15 fuel prohibits the use in your motorcycle along with a host of other small engines. The Motorcycle Riders Foundation believes that, until higher blends of ethanol can be approved for use by both the EPA and motorcycle manufactures, the federal government must guarantee the availability of fuel blends containing no more than 10 percent ethanol (E-10) at gas stations around the country. The MRF fully intends to submit comment when it becomes available in the new rule making process in the coming months. So, what can we do right now? You may remember over the summer the MRF teamed up with representatives from the marine, motorcycling and outdoor power equipment on Capitol Hill in conjunction with Congressional Motorcycle and Boating Caucuses to discuss concerns over higher ethanol blends and lack of consumer education about the associated risks with ethanol. In conjunction with this event, we kicked off our support for H.R. 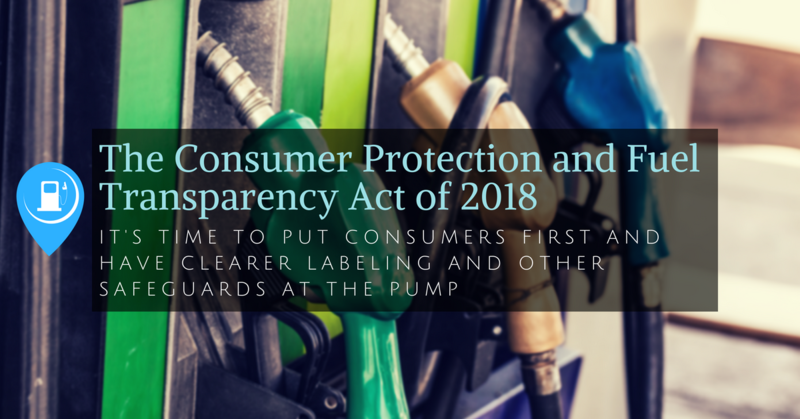 5855, the Consumer Protection and Fuel Transparency Act of 2018. Authored by Rep. Austin Scott (R-GA) and Rep. Lois Frankel (D-FL), the legislation would require EPA to revise the labeling requirements at fuel pumps that dispense E-15 and conduct a consumer education about the risks of using it in vehicles and equipment that are prohibited from using E-15 (i.e. YOUR MOTORCYCLE). You can follow the link below and ask your U.S. Representative to support H.R. 5855 and help protect consumers unknowingly using a fuel blend that will not only damage your motorcycle, and void your warranty but the EPA has decided is illegal to put in your motorcycle. WASHINGTON, DC – This week, the Motorcycle Riders Foundation (MRF) released its 2019 Legislative Agenda to its partners and supporters. A direct result of the commentary and discussion from attendees at the Legislative Strategy Session held at the annual Meeting of the Minds, this exercise establishes the MRF’s Federal Legislative Agenda for the upcoming year. The MRF’s legislative agenda showcases the diverse range of interests that the organization advocates on behalf of each year, with issues impacting independent riders, State Motorcycle Rights Organizations, motorcycle and riding clubs, the aftermarket industry and others in the community. In addition, the Agenda prioritizes aggressive campaigns to combat government intrusion with a particular emphasis on motorcycle profiling, overreach by the Environmental Protection Agency, highly automated and connected vehicles, as well as new initiatives on the clarification of the ownership of vehicle data and information. The Motorcycle Riders Foundation (MRF) is pleased to release the names of the class of 2018 Inductees to the Motorcycle Riders Foundation Freedom Fighters Hall of Fame (MRF HOF). These were presented in Denver at the annual Meeting of the Minds conference. To include deserving activists from the motorcyclists' rights community that have already been recognized elsewhere, the class of 2018 Legacy Inductees are: Keith “Bandit” Ball, Mark Buckner, Wayne Curtin, Michael “Balls” Farabaugh, “Still” Ray Fitzgerald, Richard Gray, Bob Illingworth, Nathan “Buck” Kittredge, Ed Netterberg, Sherman Packard, Todd Vandermyde, Paul Vestal, Penny Walker and Ed Youngblood. The first new inductee into the MRF HOF is President of ABATE of Michigan, Vince Consiglio. The Motorcycle Riders Foundation is proud to welcome this inaugural class and wishes to thank all the Freedom Fighters that work so hard to ensure that future generations can enjoy the freedom of the road through motorcycling. Motorcycling remains as one of the last true bastions of Freedom. The independence and exhilaration of being “in the wind” can only be understood and appreciated by those who experience it. We all know that “freedom is not free”, and for six decades many people have worked tirelessly to insure the rights of motorcyclists. The patriots of the motorcyclists’ rights movement aren’t in the fight for fame or fortune, which is good, because neither tend to find them. There are awards and even halls of fame for motorcycling, but those that work to preserve and protect our chosen lifestyle have often been overlooked in favor of racers and celebrities. We do not question that those folks are deserving of accolades, we are simply stating that the true Freedom Fighters have not received the recognition that they have earned. To address this, the Motorcycle Riders Foundation (MRF) is proud to announce the creation of the Motorcycle Riders Foundation Freedom Fighters Hall of Fame (MRF HOF). The permanent display will be housed with other MRF artifacts at the ABATE of Indiana State Office in Bargersville, Indiana. The first inductee will be announced at the MRF Meeting of the Minds conference in Denver, Colorado on September 22, 2018. Through the years, a number of people from the bikers’ rights community have been a part of various halls of fame and the MRF wishes to include them as well. The MRF HOF will announce a number of Legacy Inductees each year until those deserving recognition in the MRF HOF are featured here, in addition to their previous distinction. The MRF wishes to thank our State Motorcyclists’ Rights Organization (SMRO) partners and all of the people that work vigilantly to preserve, protect and promote motorcycling so that future generations can enjoy the freedom of the road.